March Mayhem voting begins Monday, so fill out your brackets today for your chance to win one of three Alienware laptops! Once the tournament begins, the opportunity to fill out a bracket will be over. 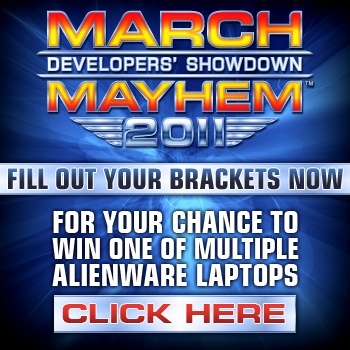 Alienware is sponsoring March Mayhem this year and giving away some amazing laptops as prizes! There are many ways to gain contest entries, but the easiest 25 come from filling out your bracket. The best part is that the 25 entries are given to you regardless of how well you predict the winners. As a side bonus to filling out a bracket, the top 10 brackets will win a Publisher's Club account! All the prizes will ship internationally, so if you are over the age of 18 there is no reason you shouldn't fill one out. You have to hurry because the brackets are only available through this Sunday, March 13th at 11:59PM ET. Voting will begin on March 14th at approximately Noon ET at which time all brackets will be locked and no changes can be made. For a full set of rules on how to participate and get to your bracket, click here. Good luck and welcome to the Mayhem.